In an episode of “Through the Wormhole with Morgan Freeman,” Morgan Freeman suggests that robots may be the future of human evolution (Season 4, Episode 6). A “what” didn’t conceptualize and build the robots. Robots have not evolved like evolutionists claim chemicals, with no design, information, or intelligent purpose, evolved into what we see in the world today. Humans designed and built the robots. Robots are far less complex than humans, and yet evolutionists swear on their science books (which they wrote) that we’ve evolved from nothing into something. The Corvette didn’t evolve in any way like evolutionists claim that inorganic chemicals evolved into us. The Corvette had conceptual designers, engineers, technicians, and a labor force to bring a concept car to a finished product. Without them, there never would have been a Corvette. No amount of time and chemicals would have “evolved” the Corvette or any single part of a Corvette. The same is true of robots. Take a look at the encounter that Freeman has with a robot, and ask this question: Did it evolve or was it designed? 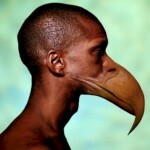 The new evolutionary claim is that one day we could evolve beaks. “Dr Gareth Fraser, from Sheffield University [in England], said the process could see teeth fuse together to form a bill over millions of years. Given his hypothesis, we could evolve an extra set of hands for multitasking. This is what passes as science.